We are a local business based out of Sacramento, Ca. We travel 40 miles in every direction serving the greater Sacramento Area. Call us for a consultation today, we are happy to help. Summer got your sweaty inside? We bring the cool back. System or Ductless Systems available. ​We'll help you turn up the heat. We can build houses. We think that's pretty cool. Remodel your Bedroom, kitchen, bathroom, or add on a new room. Spice up your home. Front Yards, back yards, side yards, pathways. Flowers, trees, grass and more! System not working? Hearing strange noises? Something leaking ? Let us check out the problem. We'll fix it too. Interior painting and exterior painting. Your favorite colors only. Tile, hardwood, carpet... you pick, so many beautiful options. Build your home the way your see it. We will help your vision come to life. Old and leaking roof? We fix and replace home and business rooftops. Call us or fill our our form and a representative will call you at your convenience. We are the best air conditioning company. If you need an ac unit repair done correctly, then call our expert team today. The best heater repair company in Sactown. Great Heat and Air systems are essential to great quality of life at home or at your office. Stop working in uncomfortable conditions. We are the best at repairing air conditioners. If you like it cool in the winter, thats ok with us! Figure out the cost of new air conditioner by calling one of our professional HVAC experts. One of our Kingdom HVAC Expert Technicians, Wil, hard at work. Josh & Eric assessing the problem in a mini split ac for residential heating air repair. We check your system inside in out to prevent any possible dangers. ductwork panels, and make sure there are no leaks. Your safety is our number one priority when it comes to our projects. ​Sometimes power may be lost to a light fixture, receptacle, appliance, or electronics. Other times a circuit breaker or GFCI will trip for some unknown reason. Flickering lights and an intermittent loss of power are usually attributed to a loose wire connection. A loose wire connection can cause the wire to overheat, eventually causing the connection to fail. We perform furnace tune-ups and repairs, as well as heat pump installation and maintenance. Heating and air near me has never been easier. We do this because when your with us, it's family. Family heating and cooling from our family to yours. We will assist in choosing the right unit size for your family, install your thermostat, and keep your heat efficient with managed control in every room. Heating and cooling repair has never been simpler. If you need Sacramento HVAC repair at home or place of business call us to schedule an appointment. You can also fill out our contact form and we will get back to you as soon as a representative is done helping other guests. Once an appointment is made, our professional technicians will head to your location to assess the problem or give you a free replacement estimate. We will be at your location, on time, for superior heating and cooling advice and best ac repair Sacramento has ever witnessed. Thats right, just look up heating and air repair near me, schedule and appointment with us, and boom! Your house is back to normal in no time. When it starts to get cold outside you want to have peace of mind that your furnace is going to function. Our HVAC experts have the skills and knowledge to assess any furnace problem. ​The most common reason to need furnace replacement is age. If your furnace is over 15 years old, then it may be time to consider furnace repairs, furnace repair services, or furnace replacements. If your air conditioner is not used in the wintertime, it is recommend to maintain your system before the hot summer season. This should be done every year. The changes in temperature all through the year may cause a unit failure. It can begin to consume more energy and you will have to pay more on your energy bills. Fungi may form outside the air conditioner and cause a nasty smell in your house . We offer routine maintenance agreements to make sure this does not happen. Sacramento hvac repair is here for you! The a/c works by getting rid of heat and humidity. Humidity passes through the air conditioners cooling coils . A system that is too large for the room will not be able to remove the extra humidity in the room. When a unit keeps turning on and off the room will start to feel clammy. You must make sure you have a properly sized unit in order to cool the room most effectively. Mini-split systems are also available. Sacramento ac repair also offer mini-split ductless systems that work like central systems that has two main components. A compressor-condenser and an air handler containing a coil and fan. The two halves are connected by only the coolant tubing. 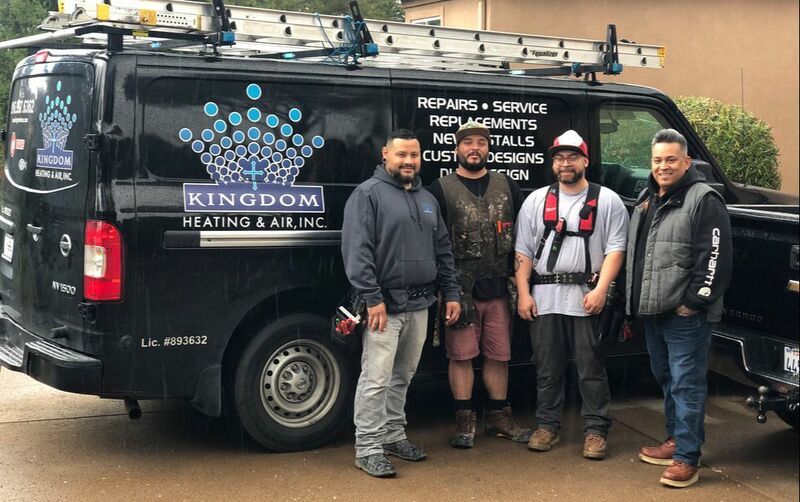 In the summer months when your air conditioning does not seem to be working and you are sweating in your house, then make sure to call Kingdom Heating & Air, Inc. to have a awesome technician come assess the problem. You should be comfortable in your own home this summer. Let us help. 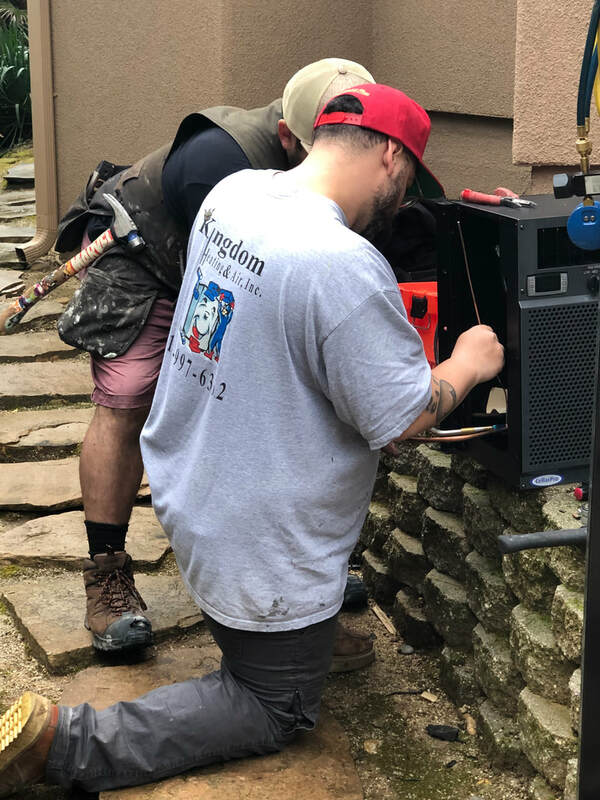 When we come out to your home we make sure to check out the following things: Proper voltage, Contractors & Relays, Burners, Blower Assembly, Clean Condenser coil, electric stip heaters, proper refrigerant, Vibration noise, Blower assembly, thermostat, fan limit switch, motors, heat exchange, electrical connections, safety of system, Belts, and more! AC repair Sacramento also provides maintenance checks to ensure that your system operates longer and reduces high energy bills. Heating and air conditioning Sacramento designed its company around efficiency advances, easy installation and comparability, user satisfaction, and lower energy costs! Remember to think about the size of the room that needs air conditioning. A unit can be too small for a room and not cool anything. If it is bigger it will be less effective then the regular size. Large systems use more energy than smaller units. Don't let a broken Air Conditioning system ruin your summer! Kingdom HVAC came out to our commercial building and checked our our air conditioning system because the air was not getting through. Danny was a nice guy and it showed he cared about his work. He did an amazing job fixing the air flow and now our entire building has cool air. ​He came to my home when my ac was broken and gave me a fair estimate. He checked everything and was honest with me about the repair. I recommend to anyone in Sacramento who needs their air conditioner or heater fixed. Called to get an estimate for an air conditioning repair service and some friends recommended me Kingdom. Talked to the owner Danny and he was able to come the next day to check out my system. He was able to fix the rattling noise coming from my a.c. air flow is now good and I am a happy man. Recommend to those with homes or apartments in Sacramento, Ca. ​ knowledgable. I received his number from a friend of a friend and he came out to my house that day to fix the problem a different electrician tried to fix the day before. I would recommend him to anybody. ​with our installation. They are reliable, efficient, polite, friendly, stayed within budget and time frame. Excellent workmanship. It was a pleasure having them working in our house. The HVAC has worked flawlessly for now almost a year. I have the variable speed, low noise blower motor running, continuously following set schedule and switching between cooling and heating automatically. We highly recommend them. ​ renting a house there and out of nowhere my air conditioner broke right in the middle of summer. When it is really really hot. Like sweaty hot. Like I needed it fixed I couldn't sleep needed it fixed asap. I called Kingdom and in no time my air conditioner was up and running again. Thank God. I was very happy with there service. Best prices too! 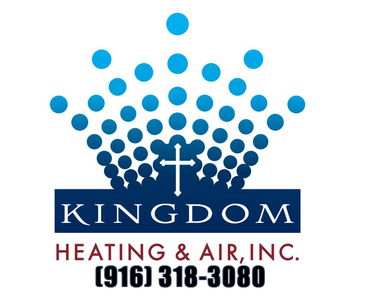 Kingdom Heating and Air, Inc.